Deploying fleets of autonomous robots in real-world applications requires addressing three problems: motion planning, coordination, and control. Application-specific features of the environment and robots often narrow down the possible motion planning and control methods that can be used. This paper proposes a lightweight coordination method that implements a high-level controller for a fleet of potentially heterogeneous robots. Very few assumptions are made on robot controllers, which are required only to be able to accept set point updates and to report their current state. The approach can be used with any motion planning method for computing kinematically-feasible paths. Coordination uses heuristics to update priorities while robots are in motion, and a simple model of robot dynamics to guarantee dynamic feasibility. 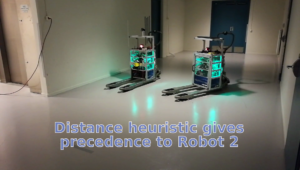 The approach avoids a priori discretization of the environment or of robot paths, allowing robots to “follow each other” through critical sections. We validate the method formally and experimentally with different motion planners and robot controllers, in simulation and with real robots.